Our first day in Amstedam is over, and we found good beer. I’m sure you’re not surprised. So far, we have felt very comfortable in this great city. It was ten minutes to noon, when the skies darkened and then five minutes later lit up with lightning. 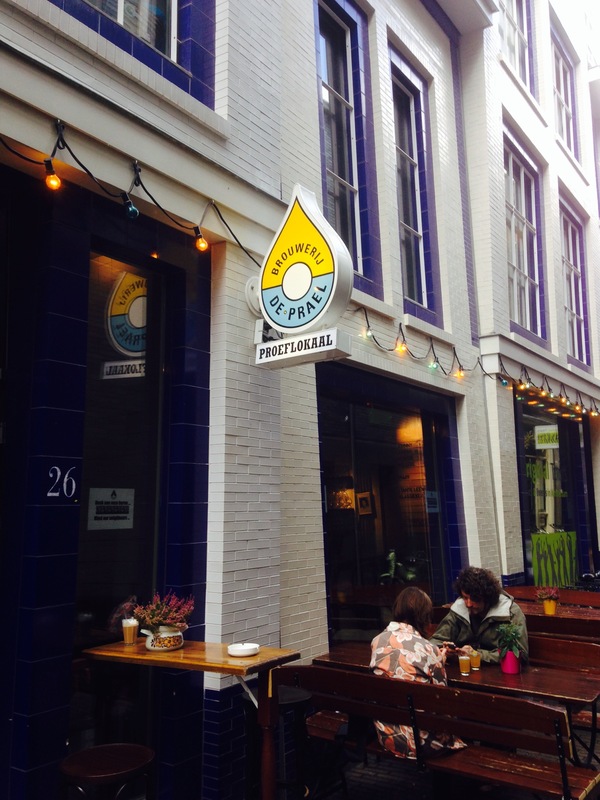 We know the signs of a potential downpour, so we backtracked to nearest beer bar in the Jordaan Neighborhood. Thankfully Proeflokaal Arendsnest just opened and we entered as the rain let loose. 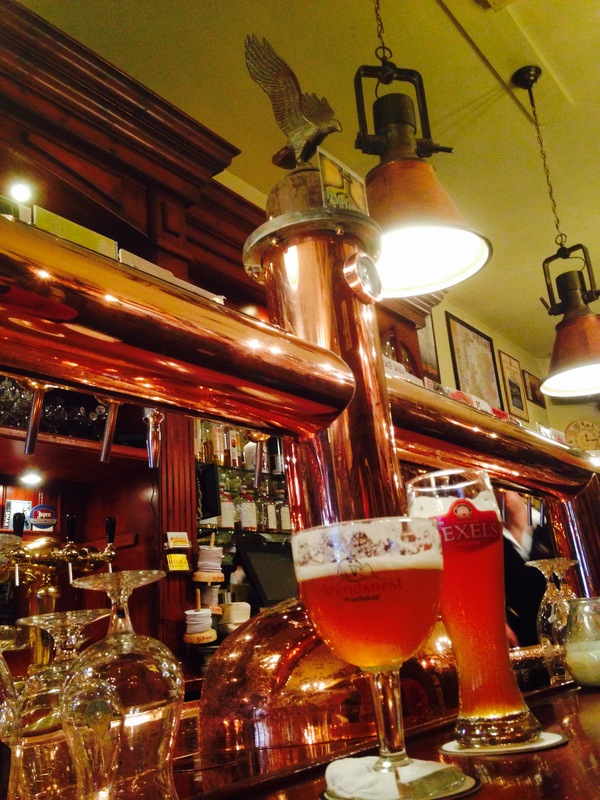 The cozy pub features 30 Dutch Craft Beers on tap. We felt right at home! The worst part was looking at the blackboard and deciding what to drink. Luckily they serve schooner sizes (roughly 10oz or 25cl) so you can have a few and still be able to function. To start, Cindy went with Texels Skuumkoppe (Amber Wheat), and I had Kompaan Lente Saison. Neither disappointed. For the second round Cindy tried the Nitro Extra Stout by Jopen and I had a Koningshoeven Latrappe Dubbel. The Jopen was delightful and the Dubbel was just as expected, malty with a touch of sweetness. We look forward to a return vistit to Arendsnest and possible enjoying a beer on their canal edge patio. Hunger set in so it was time to see what a Dutch Brewpub was like. 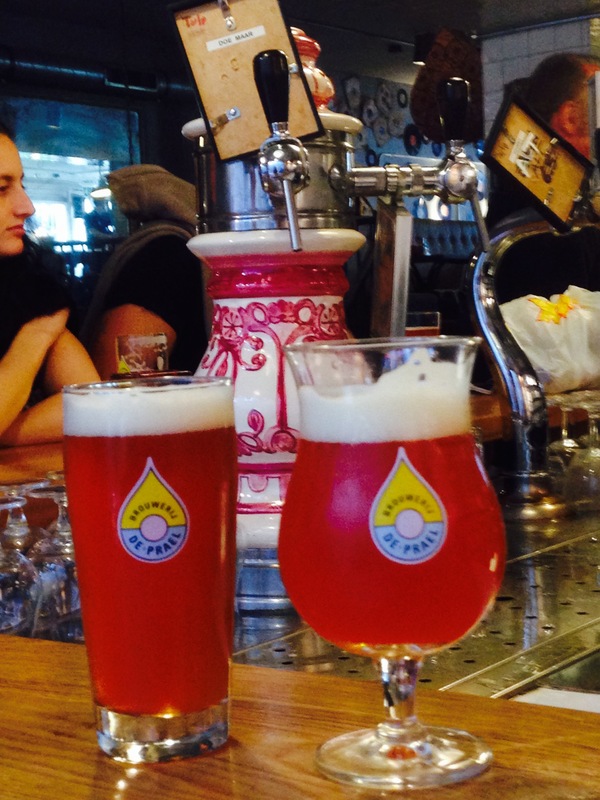 On the edge of the Red Light District, Brouwerij de Prael has been crafting beer since 2001. They have a canal facing store front selling bottles to-go and a Proeflokaal (tasting room/pub) around the corner. What a gem! It was rustic, yet modern with a Dutch misc theme. The food was good and inexpensive. The service was great. And the beer? The beer was good! We had a sampler that icluded a German Kolsch (? ), their Johnny (Kolsch), Willeke (Triple Blond), and Mary (Barley Wine). All of their beers are named after famous musicians. Cindy prefered Johnny and liked Willeke best. As a nice touch the sampler included crackers and water to clense the palate. We followed the samper with the Johnny VK (Alt) and the Doe Maar (Scotch), as two Dutch Bachelor Parties joyfully faced off in the alley behind us. One bachelor was dressed as a large baby with his buddies all wearing matching yellow jerseys with their alias printed on their backs for the occasion other party dressed their bachelor as a human heart and wore Mardi Gras beads. Cheers and photos ensued. Oh what fun! One of the bartenders was kind enough to write down some suggestions of places to eat things to do that she enjoyed and encouraged us to look up the band Doe Maar on YouTube. Before returning to the apartment we stopped by a grocery store to buy food and some beer for later. We returned with St Bernard Grottenbier, Amsterdam Brewboys Pale Ale, Maximus Highhops 6 Dry Hopped IPA, Maximus Saison 5, De Prael Nick & Simon LIPA (Lowlands IPA), and Brouwerij De Rijp Woeste Willem Hoppen Blond. I look forward to trying all of them. The best beer of the day was a ‘t IJ Zatte that I had with dinner at Walter’s in Northeast Amsterdam. An area a away from the touristy central district that reminds me a bit like Portland, Oregon and Vancouver, BC. 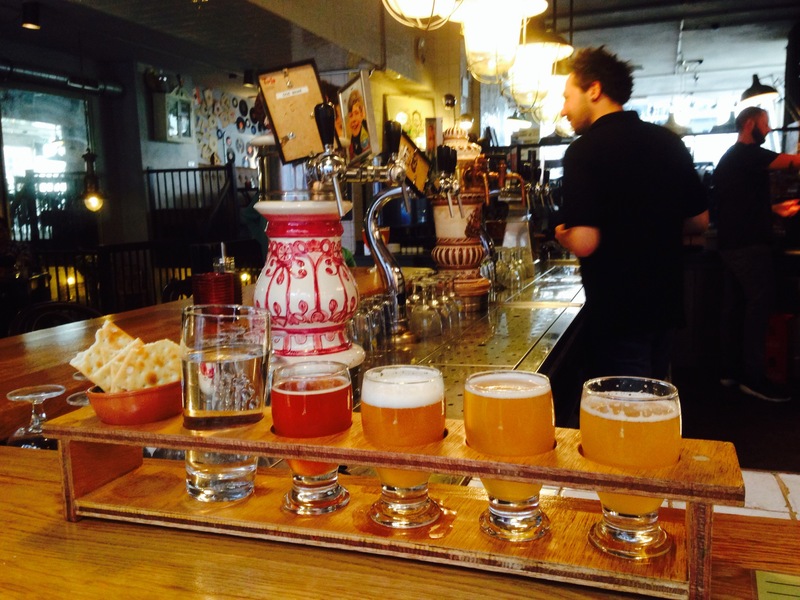 I look forward to visiting the Brouwerij ‘t IJ at the base of a real wooden windmill.